Good customer service is a given, right? You wouldn’t even think of hiring a corporate caterer with poor customer service ratings, so what is there to talk about? Well, when it comes to catering, it is important to remember that good customer service goes well beyond your normal people skills. 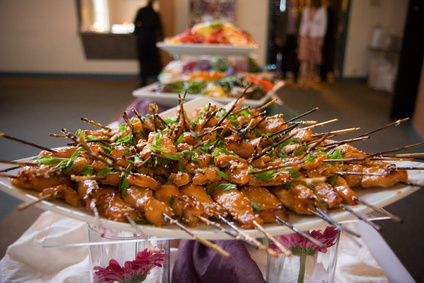 You want a caterer that will work with you to design an adequate menu that will meet most everyone’s needs. That means your caterer might need to be flexible in certain areas, especially if some of your guests have food allergies, strict personal preferences or religious dietary requirements. This seems like another no-brainer, right? While having good food may seem like another obvious must have, many people often get so caught up in the presentation and the decoration that they forget about the quality of the food. However, the fact of the matter is if the food is bad, no amount of niceties can make up for it. Don’t misunderstand us, good presentation is undoubtedly important, but presentation, no matter how sophisticated, is always quickly negated if the food is terrible. What could be more horrifying than your guests leaving your corporate event with severe food poisoning? Not only does something like that make the catering company look bad, but it also reflects poorly on you. When you are searching for a caterer, it is important to ensure that they comply with all food safety laws and regulations. From cleanliness to food temperature, the catering company you choose should be well aware of and exceed those expectations. Contact A La Carte Catering and Cakes to learn more about what we have to offer.